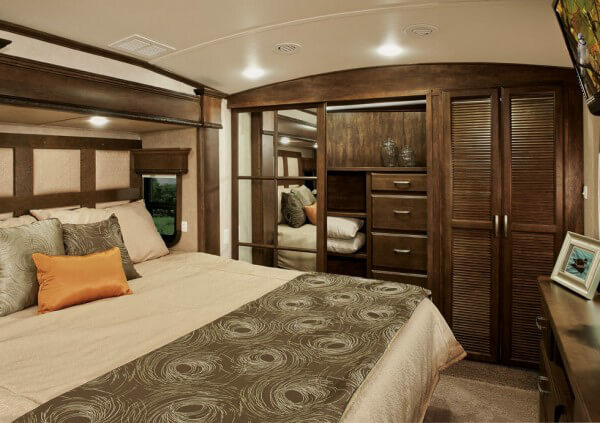 The Tradition DRV provides full residential capabilities as a four season fifth-wheel RV. Customers may visit this IN area Tradition DRV dealer to see how one feels. There is no need to sacrifice on amenities in the Tradition DRV. Plus, this RV features standard automatic 6-jack level up, frameless Thermopane windows and a gourmet kitchen with residential refrigerator. 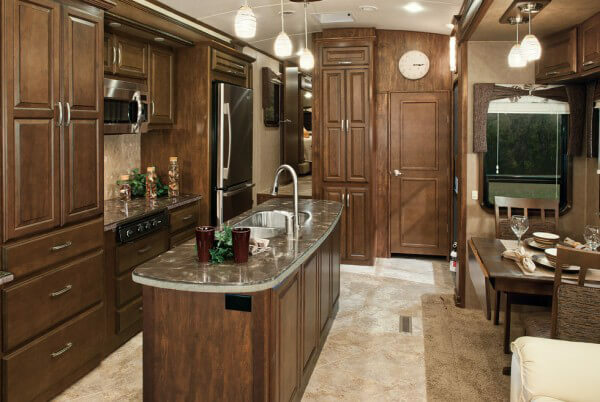 There are many floor plans for Illinois RV shoppers to choose from. Plenty of sizes 34' to 39' are available to make sure your family has the space you require. There are some features that come with the Tradition DRV no matter what size you get. Standard features include straight roof line design, power awning with aluminum weather shield, step light, 4 scare lights, washable storage compartment liner, high gloss gel coat exterior fiberglass, frameless thermopane windows, one piece rubber roof, a ladder, outside gas grill hook-up an outside TV hook-up in basement. 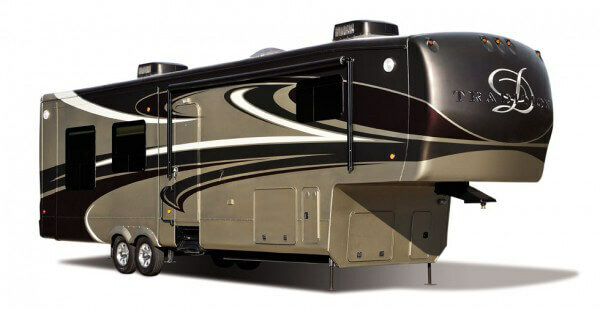 For questions regarding the exterior features, please contact our IL RV dealership. Highlights of the most used area of the house, include a fireplace with LED lighting and wireless remote, power lift TV, 47" HD LCD TV with Blu-Ray DVD player, Bose Sound Bar Surround Sound system built into overhead cabinetry, Lane recliners, sofa and theater seating; hide-a-bed mattress, pull-out drawer above fireplace, and magazine rack. This might be the nicest area in the RV. This Illinois Tradition DRV model makes you feel at home with its luxury and cozy atmosphere in the gourmet kitchen area. Inside the Tradition DRV kitchen find a GE Stainless Steel Convection Microwave, Amana 3-burner cooktop with Gas Oven, stainless steel 18.5 cubic-feet Whirlpool residential refrigerator, large dual bowl stainless steel sinks, LG solid surface countertops with sink covers, residential kitchen faucet with pull-out appliance trays, and dinette table with large dinette chairs. The Tradition DRV systems give you everything you need to have luxurious living quarters. Living the RV life means you get to go where you want, when you want, and all in style. There are tons of features, some highlights include ultra quiet A/C ducting with cold air returns, water pump control switch in outside command center, central vacuum, cable hookup, outside shower, 40,000 BTU furnace system, perimeter heat ducting in living room, 6 extra large heat ducts t/o, heated bathrooms, and a hydraulic/electric bedroom slide. The only way for Indiana RV shoppers to truly appreciate everything an RV has to offer is to visit our dealership in Illinois. Phillips RV Sales serves customers from all over Illinois to Indiana so please contact our RV dealership for more information today!